Plastic pallet wrap and LDPE packaging films are a revolutionary packaging material, however they’re also a blight on the environment when not disposed of correctly after use. 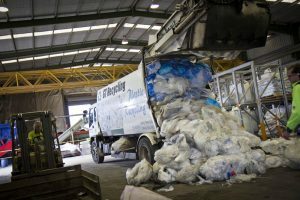 GT Recycling is a leading LDPE packaging film recycler Melbourne and Geelong which is capable of recycling packaging film waste. We offer a collection service for pallet wrap and LDPE packaging films in industrial areas of Tullamarine, Campbellfield, Laverton, Altona, Derrimut, Dandenong and Geelong. Did you know that even though LDPE packaging film is single use, it’s made from a highly recyclable plastic that can be turned into new products including bin liners and builders film. Don’t let your pallet wrap and LDPE packaging film go to waste when it could be collected from your factory and recycled, helping the environment while saving on disposal costs.